A Tiny Child's Voice~ : YAAAAY!!!! 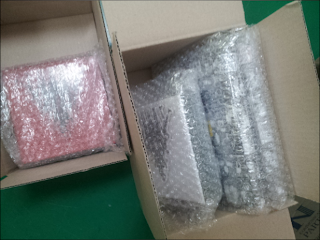 Kpopmart sent me an email saying my EXO albums have been shipped with a picture of them being packed away (like they usually do). I'm so excited, I just had to upload the picture. I ordered Miracles in December (both versions) and 1st Album Repackage (both versions) on the day Miracles of December was released. I know I'm super late on the Repackaged albums, and I normally would pre-order EXO's albums but I did not have money at the time and I had to wait until I did. I finally decided I did when their 2nd mini album came out and I was desperate to get it. I need to support my boys! I thought I would recieve it before Christmas, but I'm thinking that I won't now, unfortunately. I'm expecting it in early January (around the 6th). But I'm still super excited. I already have all the tracks on my iPod and phone so I've listening to it every day since. My favourite song has got to be 'Christmas Day'. (It's Lay's favourite song too! :D). Hey, should I do a album review soon? Before Christmas?